Most health insurance programs require home sleep testing (HST) as the first step for diagnosing sleep apnea and CSI provides a complete and supportive HST program for our patients. CSI sleep professionals will fully instruct you in using the HST equipment, demonstrating how to position the equipment on your chest, nose and finger. The CSI staff will provide you with information on how to prepare for the most effective sleep test–by avoiding caffeine for example–as well as a 24-hour telephone help/support line. When you return the HST equipment CSI staff will download and review your results with you and your physician, including next steps depending upon the results of your home sleep test. At CSI we are committed to your healthy sleep. 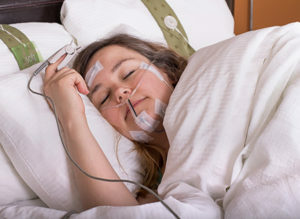 Your in-center sleep study will be supervised by our board certified sleep specialists, registered sleep technologists and registered respiratory therapists. You may see a CSI staff physician by calling us directly and speaking with a Patient Care Coordinator who will schedule your consultation. Or your personal physician or specialist may refer you to CSI for a prescribed sleep study. Your CSI Patient Care Coordinator will support you in your preparation for your study. We will schedule your appointment so that you arrive at the center several hours before your normal bedtime. If you choose, you may leave your automobile in our patient parking area or someone may drop you at the clinic. Our sleep center amenities are similar to a hotel. Bring something comfortable to sleep in and your own pillow if you wish. Be certain to bring any medications you will need during the time of your study and any toiletries that you would pack for an overnight stay. If you forget something, please ask your technician for assistance. Complete the form and a Clayton Sleep Institute sleep professional will call you to schedule an appointment. Clayton Sleep Institute accepts most insurance plans and offers flexible payment options. Personal hygiene products—toothbrush, toothpaste, hairbrush, etc. In your private room you’ll find queen-size, Select Comfort bed with luxurious linens and hypoallergenic pillow, a 32-inch flat screen high-definition TV with cable or satellite, a nightstand and a sitting area with leather recliner. The Select Comfort will allow you to personalize the firmness of your mattress support, and we have added a memory form topper for additional cushioning. 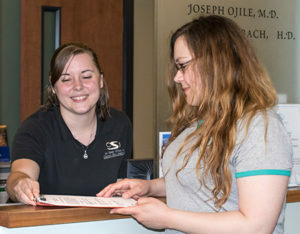 When you arrive you will be greeted and checked in by one of our friendly staff, who will show you to your room, will take you on a quick tour of the clinic and will review procedures for your stay. You will unpack, get comfortable and complete some necessary but brief paperwork for your records. You will be able to watch television, read or use your electronic equipment up until bedtime. At that point we will require that you turn off all personal electronics so they don’t interrupt your test. If you wish, we will provide you with complimentary bottled water or a non-caffeinated beverage before bedtime. Please note that CSI is smoke free. If necessary, you may smoke in designated areas outside the building. Prior to bedtime, your sleep technologist will place several small electrodes on the surface of your skin to monitor physiological patterns such as brainwaves, muscle activity, breathing and snoring. There is no pain associated with applying the electrodes. During your sleep test, CSI technologists will monitor your sleep through the signals from the electrodes and on the consoles in our lab technology room. After you awake in the morning, a CSI sleep specialist will briefly review and explain any preliminary test results. Final evaluations will be reviewed and discussed with you by a CSI staff physician or forwarded to your physician. Our CSI clinical staff is always available for consultation with your physician about your evaluation and treatment. Your plan of treatment will depend on your diagnosis. Your treatment will be the optimum for your condition and to restore healthy sleep. If appropriate for your medical needs, CSI will conduct an out-of-center sleep test for you—often called a “home sleep test.” But we will always recommend the type of sleep study that will deliver the best testing for your personal care and wellbeing. Clayton Sleep Institute is accredited by the American Academy of Sleep Medicine, the national medical body that sets standards and examines sleep clinics, to perform both in-center and out-of-center sleep studies. For more information about sleep studies or to schedule a consultation, call CSI at 314-645-5855.